At the Milne town house, Aberdeen. c. 1891 L-R unknown girl, James W Barclay of Glenbuchat. Lady seated - Florence Milne nee Barclay, daughter of J W B, unknown girls. ? 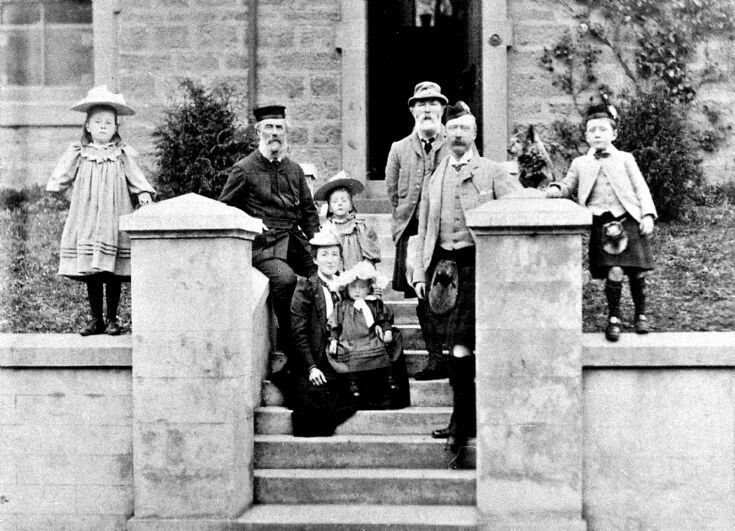 Milne of Kinaldie, father in law to Florence and father to George Milne of Logie, standing on right. Boy on wall is James Barclay Milne, born 1886, son of Florence and George. Dear Angel, I don't think J W Barclay was related to the Barclays of Ury. For a history of J W 's family origins, see entry 821 on this site.